The Find My Friends app is a great way to find people who are important to you and share your location with them. Friends and family members who use iPhone, iPad, iPod touch, or Apple Watch Series 3 or later and share their locations with you appear on a map, so you can quickly see where they are. You can set notifications to alert you when friends or family members leave from or arrive at various locations. See iPhone User Guide for information about setting up the Find My Friends app on your iPhone. Open the Find My Friends app on your iPhone. Tap Add, then choose a contact. Choose how long you want to share your location—an hour, until the end of the day, or indefinitely. Tap Send or Done to send the request. After your friend agrees to share their location, you can see where they are in a list or on a map in the Find My Friends app, or on iCloud.com. 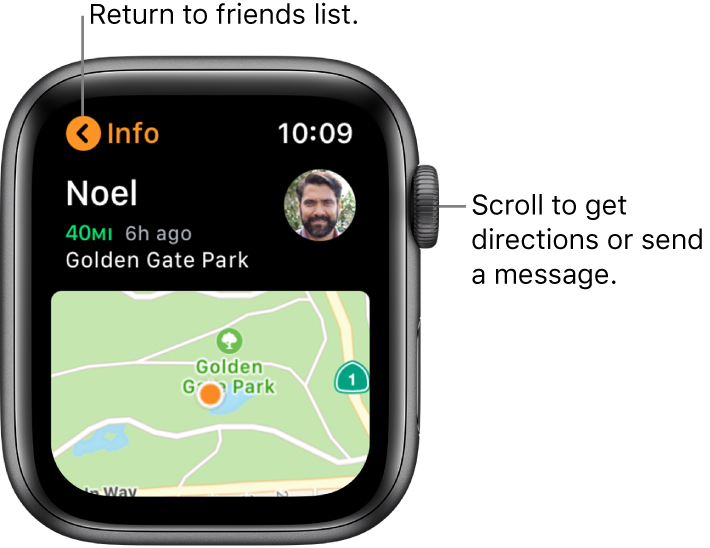 Open the Find My Friends app on your Apple Watch to see a list of your friends, with each friend’s approximate location and distance from you. Turn the Digital Crown to see more friends. Tap a friend to see their location on a map. Tap < in the top-left corner to return to your friends list. Note: If your friend is wearing an Apple Watch with cellular and is sharing their location, but they don’t have their iPhone with them, their location will be tracked using their Apple Watch. Open the Find My Friends app on your Apple Watch. Tap your friend, scroll down, then tap Notify Me. Turn on Notify Me, then choose to be notified when your friend leaves their location or arrives at your location. Tap a friend, then tap Notify [name of friend]. Turn on Notify [name of friend] on the next screen, then choose to notify your friend when you leave your location or arrive at their location.